1. A wide range of commonly used textile materials is flammable. 2. A range of situations, in theatres, restaurants, clubs and aircraft, can cause heavy loss of life in the event of fire. 3. Use of particular materials, garments and upholstery structures can lead to sharply increased personal hazard. Use of reduced flammability textile materials, testing of both textile materials and complete products, regulations and legislation have been applied to the problem. Each has contributed to reducing the risk of accidental injury, death or loss. Progress in reducing the hazard has been made, but is constrained by a series of factors. 1. The risk is not widely appreciated by the general public, except when a major disaster occurs. 2. Any solution which restricts personal freedom is likely to be avoided by a significant number of people. 3. Any canvas tarpaulin products with reduced aesthetic qualities will be less successful even if it has fire-retardant properties. 4. Any solution which adds singnificantly to product cost will tend to be resisted. The terms "flameproof" and "fire-proof" should be avoided. "Fire-retardant" is a useful general term. "Do not sustain flame" is the approved term (BS6336: 1982). "Self-extinguishing" is widely used to describe canvas tarpaulin materials which only burn in contact with an ignition source. 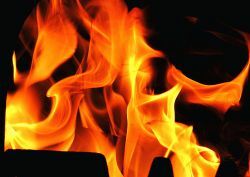 "Reduced fire hazard" or "resists ignition" are also acceptable terms but should only be used in connection with a specified test. Synthetic fibres like vinylon and PVC shrink considerably just below their melting point. This causes materials to shrink away from ignition sources making established combustion less likely. Further, molten flaming polymer falls away and removes the heat likely to spread combustion. Even before the extra cost of fire-retardant textile materials is taken into account, some additional costs are incurred when offering flame-retardant canvas tarpaulin products. These include testing, certification, labelling and promotional costs. It is also likely that product liability insurance will cost more. The extra cost of textile materials with reduced fire hazard is also significant. In the upholstery field, back-coating finishes are available which give durable fire retardant action. They add about 10% - 20% to material cost. At the other end of the scale, specialist fire-retardant fibres can cost three to five times as much as equivalent general textile fibres. In barrier-layer applications, the choice of barrier fabric is between oxidised acrylic and fire-retardant treated cotton canvas. Oxidised acrylic has reduced fume generation, and cost up to four times the price of an equivalent cotton canvas fabric. Fire-retardant treated cotton canvas and wool costs 20%-50% more than equivalent untreated fabric. There is also some loss of aesthetic properties. In view of that, it is not perhaps not suprising that fire-retardant solutions tend to be confined to products that meet specific hazards. Good examples are children's nightwear, aircraft and train interiors, public auditoriums, and protective clothing.